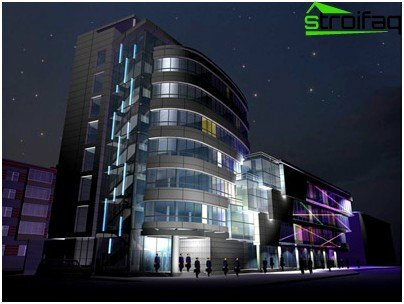 The lighting of facades - the direction of the lightDesign, which is becoming more popular. 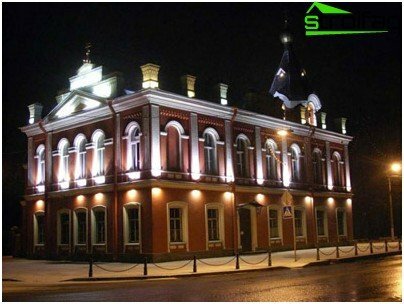 And if earlier it was used mainly for illumination of monuments and historic buildings, the facade lighting today has become an integral part of almost any building. This is not surprising, because this decorative technique not only emphasizes the shape of the construction, but also effectively demonstrates the inner content. In addition, well-directed light highlights the advantages and disadvantages hides the architectural object. Originated architectural lighting facade afterFirst World US. The brochure, released by General Electric, made a splash by opening up hitherto unseen opportunities in the transformation of appearance of buildings. The year was 1930. The time when Manhattan transformed into a marvelous city of glittering lights - magical creation of light the Impressionists. The idea was picked up quickly. Art lights in Europe developed underthe influence of two factors: fashion and expansion of electricity capacity. European versions of light experiments differed finesse and a deep sense of style. Equally important were the features of architectural masterpieces, combining notes of neo-classical, classical, Empire, Gothic, Baroque. A new stage begins in 1969 with the establishment ofInternational Association of Lighting Designers. This step was intended to change public attitudes towards lighting design. Today, the organization brings together professionals who are engaged in the study of light and art through hands-on experience can skillfully identify individual features of any structure. 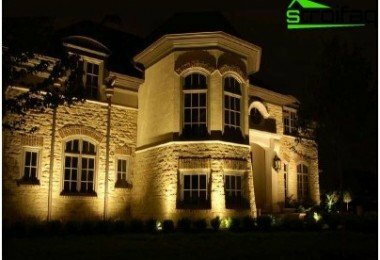 Outdoor lighting encompasses two main points - the aesthetic and functional. In addition to the aesthetic visual appealAspect brings practical benefits - memorability image and attract attention. However, apart from this street lamp must have the necessary set of qualities, allowing to cope with their duties. accent. 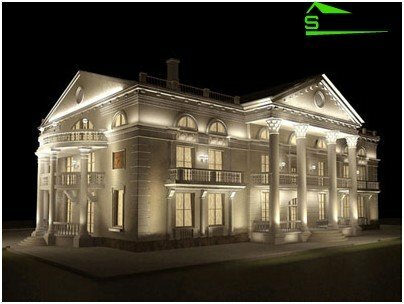 Allows you to select individual parts, are not fully illuminating the façade. Thus, emphasis is placed on the top or bottom of the building. To highlight the exterior of the applied lamps floodlight. 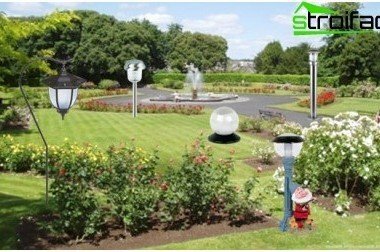 The best option - the metal halide and high pressure sodium floodlights. LED. A wide range of colors provides unlimited opportunities for the realization of any light fantasies and create extraordinary beautiful light effects. When designing lighting project is first necessary to determine the lighting techniques that depend on the objectives pursued. Thus, we consider them. Ideal for free-standing objects of culture,because It allows you to keep monumental appearance and holistic perception. 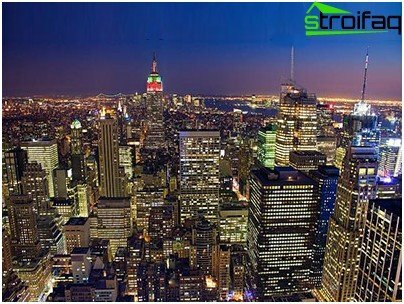 The effect is provided by the installation of projector type lamps on poles around the buildings. The maximum brightness will provide background on the structure of the landscape, pay him attention. 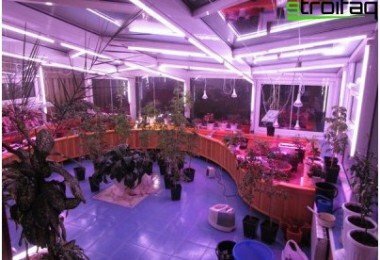 Note flood light will pass through the window, so that the reception is not the best for buildings where at night people are: hotels, business centers, residential buildings. Dynamic floodlighting facade of the house due to the uneven level of light helps somewhat to "revive" the object. Lighting is better to use light-emitting diode. Indispensable if necessary focus on a particular area: the windows, friezes, balconies, cornices, etc. To create a harmonious composition should consider every detail, associate it with the general picture. 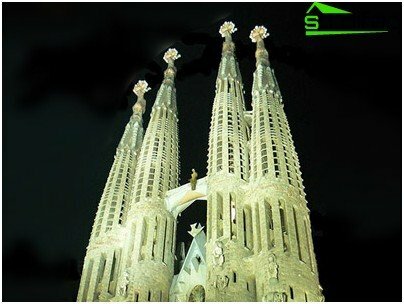 For this type of illumination used lamp smalland average power, mounted directly on the facade. 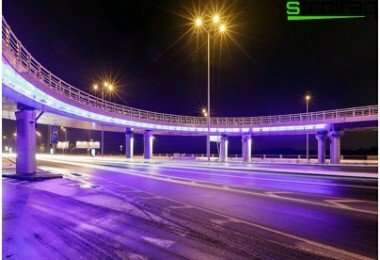 Allowed the use of linear LED luminaires, which successfully ousted bulky fluorescent installation: «Power-Washer», «Emphasis white», «DU-6», «Vari-Spot» and others. Admission is suitable for buildings with fully glazed: business and administrative centers, entertainment and shopping complexes. Light fixture (RGB or monochrome) is installed inside the building behind the glass, and on which the light beam is directed. This allows get interesting combinations of dynamic and static. The artistic way to achieveisolation outline of the building, excluding certain items. It creates a clear, strong and clear image. The bottom line - in projecting the luminous background, which appears black silhouette construction or dark. 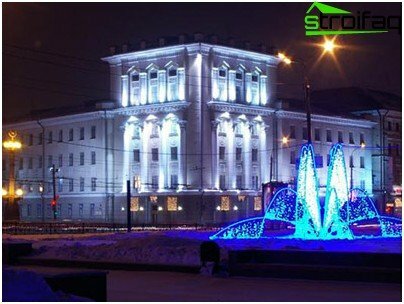 Background lighting suitable for theaters and palaces with columns, carried out with the help of powerful floodlighting LED spotlights. The new method, involving the selection circuitbuilding linear lamps. 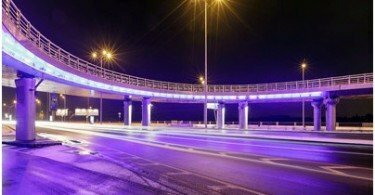 Mass application became possible after the appearance of low-cost linear fixtures - a flexible neon and LED arrays, which are installed at regular intervals along the facade. They illuminate the remarkable friezes and corners, whereby the contour of the structure becomes soft glow. 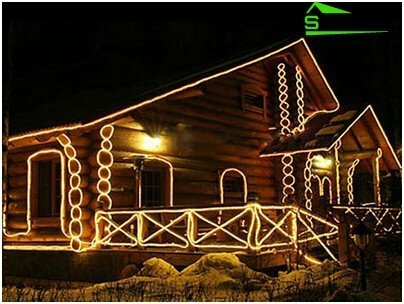 "Facade" For this type of lighting is best suited LED bars. A method of synthesizing a variety of effects: color change, increase / fading contrast, mixing colors and so on. 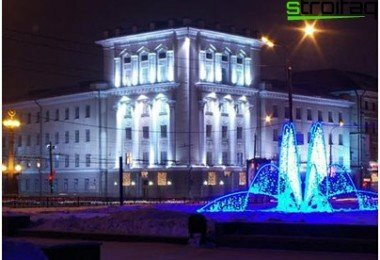 In this case, the required spotlights, LED line, dot LEDs, allow you to create bright outlines of different colors and configurations. 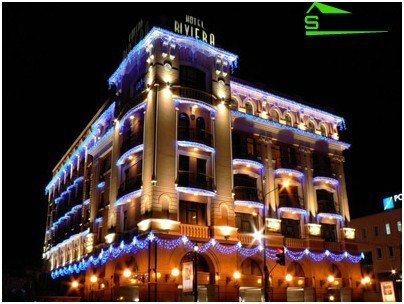 style buildings, as lighting design should be combined with the appearance of an architectural object. When selecting bulbs, consider the followingIndicators: serviceability, safety, protection from the external environment, water-resistant, the ability to work in any environment, economy. lighting effects largely depend on the angle of rotation of the lamp with respect to the facade, so must be purchased spotlights with adjustable angle. The degree of moisture and dust protection must be atless than IP 65. For buildings of historical value to use lamps on brackets, which greatly detracts from the appearance, it is inadmissible. Light - delicate matter that can createmiracles. 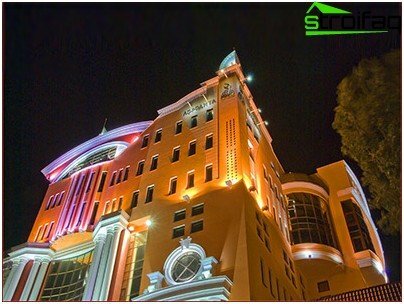 Several floodlights transform the building, give it presentable, improve brand image and attract admiring glances from passers-by. It's so nice to enjoy the city, filled with thousands of glittering lights. City where hovering feeling of something mysterious and festive.